This isn't truly a serious crime novel, but instead a casual, fun, satirical novel about Hollywood and the television industry. Goldberg has worked in the industry for decades, and I get the impression many of the over-the-top moments in this book are based in reality.My Gun Has Bullets offers shades of Hiaasen, though Goldberg isn't quite as adept as making the over-the-top moments more believable. 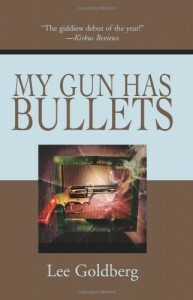 That said, this is a fun read - something I devoured in a couple hours on my brand-new Nook reader, and because I bought My Gun Has Bullets out of the B&N store, I only paid $2.99.It's entertainment value far exceeds its cost, and if you're looking for a fun read, then I'd recommend it (caution: I'm cynical by nature and find this stuff amusing).